We are going to go on a basis of the camo needs you will face if the EMP  detonates, the missiles are on the way, and the “S is definitely Hitting TF,” so to speak. The key word for you to remember: synthetics. Synthetics, such as nylon and polyester are going to provide you with what is needed. Cotton is not for exterior wear: it turns to sludge and wears out fast. Synthetics are more durable for your outer camo wear: they clean more easily and do not rip. The photo is of a military-issue top , ranging in price from $20-30, depending on the outlet. Make sure the NSN is 8415002237627, made completely of nylon with a corded drawstring for the hood. The good thing about it is it has a self-contained bag attached at the neck that the whole thing scrunches up and fits inside. As it is nylon, it will not be all messed up from the elements. You’ll want to wear face masks  that both keep you warm and break up the reflection of your face. Sunglasses are also very important to use during the winter months to protect from snow-glare and prevent snow-blindness. JJ prefers a baseball cap for its visor…this helps to shield the sunglasses as well as provide a little bit of shade for the eyes. If you have the top pictured, you can cover the cap with the hood, no problem. Also, do not neglect your protection from windburn and the cold elements . JJ’s preference for the lips is Carmex lip balm, as it has menthol that helps heal the chapping, or make your own . Don’t forget your gloves! This will help maintain body heat  when you are exposed. 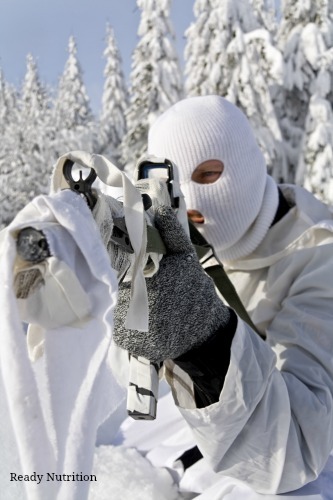 While you’re camouflaging yourself, remember to make sure your gloves are not anything other than snow tones or earth tones. Finally, subdue all things that glitter…let them not give your position away. For scoped rifles, you can place pantyhose over the forward objective lens…you can still see through it and it cuts down on the glare that would reflect off and give you away.